She's not a hawk or a dove. She changes her mind when the facts change. Monetary policy can be kind of boring, so we make up metaphors to make it sound more interesting. He's a hawk! And she's a dove! And ... what were we talking about again? Oh, right. Monetary policy. See, the dominant metaphor when it comes to the Fed are "hawks" who care more (or is it only?) about inflation, and "doves" who don't. Now, it can be a quasi-useful way to think about things, if a bit reductive. Sometimes overly so. Take Fed Chair frontrunner Janet Yellen. She's usually described as a dove's dove, someone who thinks "unemployment" is more of a four-letter word than "inflation." That's certainly what markets think about her. 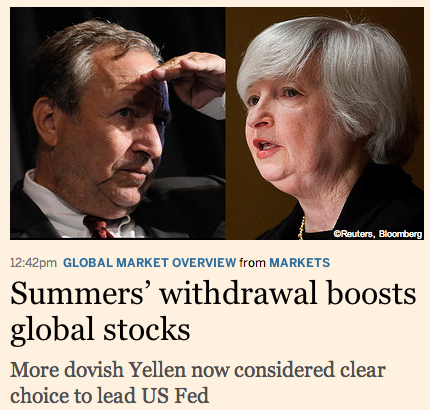 Indeed, the news that Larry Summers would not be the next Fed Chair was enough to send global stock up about 1 percent on the hope that Janet Yellen would -- which lead to this rather awkward Financial Times headline. Now, it's true that Yellen isn't very worried about inflation right now. And she thinks the Fed should keep rates lower for longer than it normally would, even if inflation rises a bit (what she calls an "optimal control" approach). But that's only because she thinks unemployment is and will be a bigger problem than inflation today and tomorrow. If that changes, so will she. In other words, she's a central banker who takes the Fed's dual mandate seriously, but still a central banker. Clearly, we have an economy operating at a level where we need to be nervous about rising inflation, even abstracting from supply side shocks. We can't dismiss the possibility that compensation growth will drift upward, raising core inflation and in turn inflationary expectations. This is a major risk. Obviously, we need to be vigilant in scrutinizing the data for signs of rising wages and salaries. Yellen was no inflation dove then. She repeated her wage-price warnings in July and December of that year, before leaving for a stint as the Chair of the Council of Economic Advisers. But she wasn't just worried about keeping inflation from rising during the boom. She was worried about keeping inflation from rising after the bust too. This was a pernicious idea that took hold at the Fed in the late 1980s called "opportunistic disinflation." It went something like this. The Fed could tighten policy to lower inflation, but that would mean starting a recession -- and starting a recession was politically tough. After all, people would blame the Fed for starting a recession! But what if instead the Fed just waited for a recession to come along ... and then didn't loosen policy like it otherwise would. The Fed could "opportunistically" keep the lower inflation from the bust during the next boom -- albeit at the cost of a slower recovery. But people wouldn't blame the Fed for not starting a faster recovery, right? It's not like monetary policy is a panacea, folks. I think the opportunistic strategy here is to take that downward pressure. Don't try to push the economy back above potential to make up for the output that you have lost in the meantime. I would endorse the opportunistic strategy... I see an opportunistic strategy as one that would not consciously use monetary policy to push the economy below potential in order to achieve a reduction in inflation, unless inflation initially were significantly far from its optimal value.... I would see an opportunistic strategy as one that would look for gains on the inflation front during periods when negative shocks unavoidably create slack in the economy. But how many gains? That was the question the Fed had to answer then -- and still does now. Then, the question was whether the Fed should try to push inflation all the way down to zero or just 2 percent. Alan Greenspan preferred zero percent inflation, but Yellen convinced him, and the rest of the Fed, that this was a bad idea: a little inflation would help keep recessions mild, and help the Fed fight them if they weren't. Nowadays, the question is whether the Fed should let inflation rise above 2 percent, if only for awhile, to speed up the recovery. It might be the most important question the next Fed Chair will face, and it's the question that shows why Yellen is the best choice for the job. She's no friend of high inflation, but she understands that inflation can be too low as well. She's a hawk when the time calls for it, and a dove when the time calls for that too. And that's what we need more than anything else. Someone who's willing to change their mind when the facts change -- but makes sure the facts really have changed before they do so. In other words, not a hawk or a dove. Just a central banker.